Back in 1990, my siblings and I were granted an HB-1 Visa when my mother got accepted as a Hubert Humphrey scholar at the University of Texas. Those visas were left unused however but since then, I have had the desire to visit the land of milk and honey, not to mention, Hollywood! Last year, after getting our immigration papers in Canada, my family of 3 applied for a US Visa so we could finally fulfill that long-desired visit. We were all fortunate to have been granted 10-year multiple entry visa. For those who aspire for the US Non-Immigrant (Tourist) visa but are not in the know-how of things, here are a few things I can share regarding the experience. Payment per application is US$160.00. 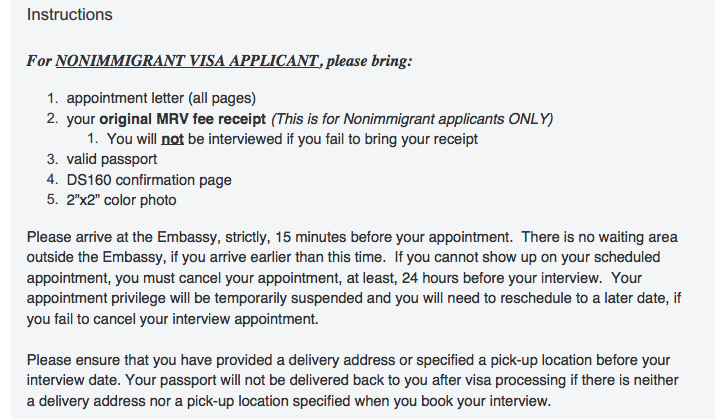 You will need to fill up the DS-160 form and create an account in the US Embassy's website. If you are in the Philippines, please click here. Remember to be honest with your answers because as from what I heard, they conduct background checks. Once you are scheduled for an interview, you will be given instructions on what to bring. Cellular phones are a no-no but you may bring supporting papers like bank statements, employment certificates and other similar certificates. In my case, I only brought papers required as instructed in the Appointment Letter, and my bank statement and employment certificate. 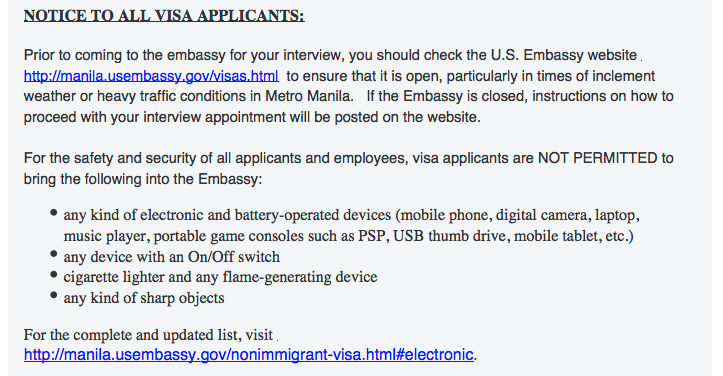 Prepare yourself to be grilled by embassy personnel during the interview. These officials are trained to think every individual who wants to go the US have plans to stay there illegally. Your task, therefore, is to make them believe otherwise. Should you have any family members or relatives who were caught staying illegally and deported from the States, your chances of getting a visa are slim to none. Remember to answer only what is asked. A Yes or NO question should only be answered by a Yes or No answer. Avoid justifying them as it can be misconstrued as defensiveness, which will cast doubt on you and the reason why you want to go to the US. If your parents have a pending petition for immigration in the States, this must be noted on your application as well even if that petition was some 30 years ago, because there is a possibility that you are incidental to that petition. My sister, on her first try, was denied because of this. Not her fault though because she had no idea our family was subject to prior petition from an Aunt back in the 80's. Please check with your parents first. Stay calm and focused. Interviewers can be very intimidating. We had the misfortune of being assigned to one who talked down all her applicants. Short of screaming, she talked in a really loud voice meant to browbeat us and let everyone in the room in our dialogue. It was embarrassing and it took a lot of effort on our part to remain calm and not be shaken by the experience. I supposed that is part of the strategy. Some are lucky they don't get asked too many questions as in the case of both my parents who only had to answer as little as four queries each. Some are asked a million questions. So just be prepared. Now on to what will get you denied a visa. A disclaimer: I do not work for the US embassy and the following are just conjectures formed from conversations with countless friends who were denied visas, as well as from reading articles and watching shows that tackled immigration issues. First, lack of work experience. Second, short employment duration with your present company. Say, you have only been working for less than a year. I heard this myself to one of those who were interviewed. Third, short duration in your rented apartment. Fourth, lack of sufficient funds. You should have at least a minimum US$7,000.00 especially if you declared you are paying for the trip. You have to account the cost of air fare, daily expenses, etc. And lastly, lack of family members or relatives living in the states. Basically, you just need to show them you have more reason to go back to your home country rather than staying in theirs. As an imparting message, let me share with you a story of a former colleague who, some 10 years ago, got accepted for a job in Hawaii. During his interview at the embassy, he was informed he would not be granted a US Visa. When he asked why, the officer advised him he did not possess any assets in the Philippines. My colleague retorted, "I have told you I have my own house built on my mother's lot. My wife and kids are staying there. I am telling you the truth. Do you want me to fake documents instead to show you I have when, in truth, I do not?" The officer granted him a Visa. So good luck on your application and remember that honesty is the best policy. Yeah, very intimidating. The one she interviewed before us, in a very loud voice, says to her, I am sorry..but i can't grant you a Visa. That was really an experience ha?